The fibers of this muscle skips C1 as it runs from C2 to the occiput, lateral to the rectus capitis posterior minor. It is also known as the Greater Posterior Rectus Capitis, and comprises the posterosuperior boarder of the suboccipital triangle. 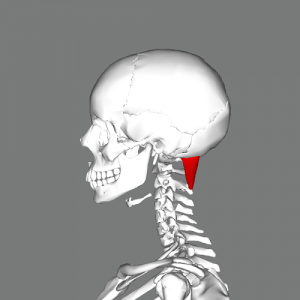 Tip of the spinous process of the axis (C2). Lateral aspect of the inferior nuchal line of the occiput, as well as to the bone inferior to this line. Suboccipital nerve or dorsal ramus of cervical spinal nerve (C1). Vertebral artery and the deep descending branch of the occipital artery. Ipsilateral rotation of the atlantoaxial joint. 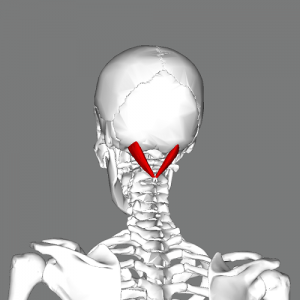 Likely a postural muscle that monitors the position of the head. ↑ 1.0 1.1 1.2 Travell JG, Simons DG, Simons LS (1998). 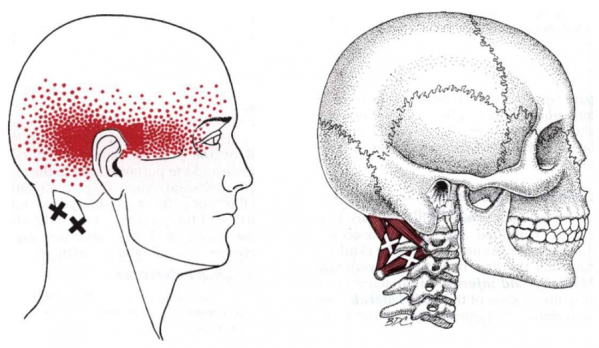 Travell and Simons' Myofascial Pain and Dysfunction: The Trigger Point Manual, Volume 1: Upper Half of Body (2nd ed). Baltimore, MD: Williams & Wilkins. ↑ Agur AMR, Dalley AF (2012). Grant's Atlas of Anatomy (13th ed). Philadelphia, PA: Lippincott Williams & Wilkins.